It was after the end of prayers and suddenly many young men from the village showed up, pick axes in tow. “The Shabaab will break the ground, you will put in the plants.” We quickly settled into a rhythm, conversations flowing and laughter ringing across the field as we watched row after row of thyme settle its roots into the dirt. The fierce desire to remain rooted in a place, in the face of so much violent opposition, bureaucratic antagonism, and a prejudiced system almost seems naïve. Yet, existence is resistance. That line has been echoing in my head all weekend. This weekend, an unprecedented event took place. Over the course of 36 hours, 71 people spent time working in Susiya, Bir el-Eid and Umm al-Khair in the South Hebron Hills in the West Bank. Here’s the catch—most of those people were Jews. This all began almost three months ago, the eve of Netanyahu’s re-election, a living room was packed with members of All That's Left discussing the potential of organizing a large action of resistance to the occupation (full disclosure, I am a member of this group). Shay, an Israeli working with Breaking the Silence, told us the news that in Susiya, there was a request for a large group of people to come and help build a road. The meeting ended at exactly 10PM as the election results came in. The group dispersed, and the morning after, a sense of determination had taken root. Months of planning become reality this weekend. The South Hebron Hills is located in Area C of the West Bank; there are numerous Palestinian villages that are “unrecognized” by the Civil Administration. These villages do not exist on the “master plan,” do not receive basic services such as water, roads or electricity, and most concerning, are under immediate threat of demolition. They are banned from construction or development. Meanwhile the 125 Israeli settlements and approximately 100 illegal outposts are not only overlooked, but also in many cases supported. Susiya has been in the news as of late after a failed attempt to bring a case to the court to have it acknowledged on the master plan. Groups such as Rabbis for Human Rights and Ta’ayush have been working with the families in Susiya through the legal channels to challenge the current demolition order. Unfortunately, as of May 4th, the case was denied and the threat of displacement was renewed. This is all part of a larger policy, similar to the situation happening to the Bedouins in the Negev, where the Israeli government is trying to consolidate people into cities, remove them from their land, and ultimately annex the entire area. This is especially worrisome in cases such as the South Hebron Hills—map here—as the annexation of these lands would be the death of a 2-state solution, as it would inhibit any continuity of Palestinian territory. So, on a Friday morning, we showed up with the intention of spending the full weekend there completing several different work projects. We were quickly ushered by Ahlan waSahlans into a shaded tent structure with that was flanked by Palestinian flags, and large poster with the smiling face of Abbas and Arafat looking down upon us. A tent was spray-painted on the side that said “Susiya forever.” Two young boys, about 7 or 9, began walking around the circle of chairs pouring and passing out small paper cups of strong, dark coffee. A much needed gesture of welcome for those who woke up early that morning to get there. As sips of morning courage were sipped, Nasser, a villager, began sharing his story, and that of Susiya, with us. After introductions, we split off into work groups. One group of about 20 people stayed in Susiya to help clear rubble off the road and plant flowers. Another group went to Bir el-Eid to clear another area off rocks and pick-axe at the stones to smooth out the road running from Firing Zone 918 to the main road near Susiya, and we went off to Umm al-Khair to plant thyme. We arrived a bit late. Flustered and already feeling the heat, we were greeted by Hamed. Hamed Qawasmeh is a story in and of itself—a one-man show who is single-handedly organizing projects all throughout the South Hebron Hills: kindergartens, toy-collections, school scholarships and more through his organization HIRN. His ingenuity and generosity are creating small acts with large impact. He helped us organize the project we were about to do: plant 1,000 thyme plants with the villagers. The thyme is a sustainable source of income for the villagers, does not require much water or care, grows well and is sold everywhere for use in making Za’atar, a popular spice mix found here. The money was to go to the villagers to help them support themselves and also to pay for their kids to go to university. Umm al-Khair sits in the shadow of Carmel settlement. When I say shadow, I mean literally the red-roofed houses of the settlements cast a shadow on the tents next door. The fence marking the edge of the field in which we were planting turns into the automatic yellow gate, which opens and closes for cars of settlers to pass through; the manicured green lawns in the middle of a desert are only overshadowed by the humming air-conditioners jutting off of the houses. The yellow gate of Carmel settlement with new caravans right behind it--a sign that the settlement is expanding. Hamed gestured behind him and said, “Just a fence separates the 21st century from the 17th.” His words struck a chord as we glanced around at the dilapidated, crude structures, the donkeys wandering around the yard, and then were quickly greeted by three young boys who began running to show us how to enter into the dirt area where we would get to work. “Yalla Yalla!” they shouted, gesturing for us to follow. We reached a hole in the metal fence and one pointed to a ladder gesturing that we could either climb over or walk through, and then he skipped over the fence and jumped into the dirt. Twenty of us then stumbled our way through the field to the edge where the planting would begin. Several village members and three other volunteers had already begun. There to the side, were the thyme plants. We were handed sticks, told to dig deep enough to cover the roots, plant at intervals, and get going. As we broke dirt, scraping with our fingers, I felt both out of place and incredibly present. It’s amazing to be with people who work the land—backbreaking, callous-building work. It’s not as easy as it looks, I kept thinking to myself. Meanwhile a 6 year old began pointing, directing, digging and planting like a fiend. None of us could keep up with him. Until one participant, began to dig with him. The two of them began to dig and plant and communicate by pointing and grunting. The six year old, Bassa, would not let Aaron rest nor work without him. Pointing and shouting “Huna huna! Here here!” he told Aaron where to dig as he ripped the black plastic off the roots of the plant, scrambled to make the hole the right size, and then plopped it in. Their partnership was one of the highlights of the day. We took a break, and hot tea was passed over the fence. Warm and sugary, we debated whether hot drinks really do cool you down in hot weather or not. Before we knew it, the work was done. We looked on our work, and one volunteer said, “Many hands makes for light work.” In three hours, we were already reluctant to leave our new friends, content to continue playing in the dirt under the hot sun and creating something together. 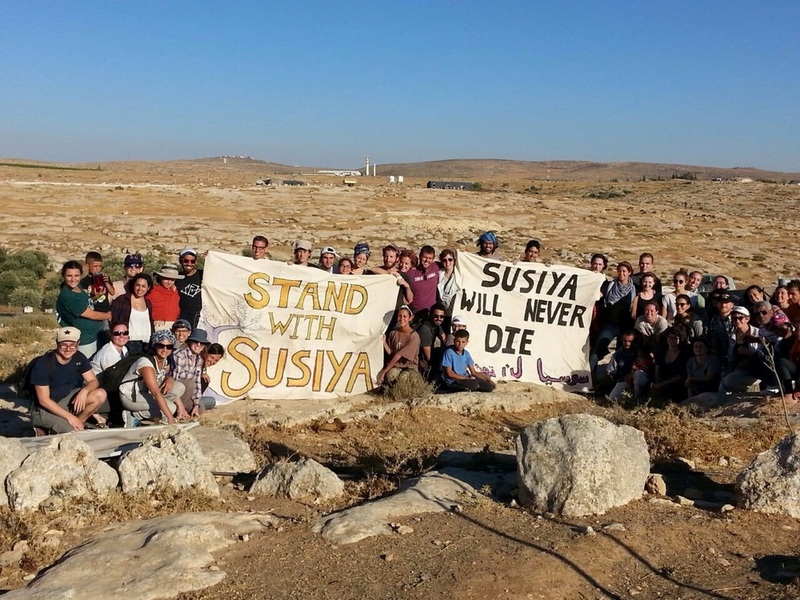 We returned to Susiya to organize with the rest of the group. Some were leaving that evening, many were staying the night and would be there the next day. I was leading the Friday group, and as we organized ourselves and got back on the bus to return to Jerusalem, my heart sang. After catching up with other members of All That’s Left who stayed for the whole weekend, the beauty of the two days is starting to settle in. My friend told me how on Saturday, they mainly worked on clearing the roads until an afternoon break with workshops and learning about honey, non-violent resistance, and Arabic. While the group was distracted, some settlers showed up. The young settlers came and began cutting off tree branches in the olive grove. Nasser, one of the villagers, showed up to scare them off, and the settlers began throwing stones at him. The soldier on watch did nothing. Some of the participants joined and the police were called. The situation ended where the police actually investigated the event and the teenagers who had been throwing rocks were arrested. As my friend Robin said, it was bad that the weekend ended like this, but it was also amazing to see that our presence had an impact. We were there to bear witness and to be present. The impact of this weekend is not the signs that were painted, the rocks moved off the road or the plants that were planted. It’s the tiny moments of sharing between people. One member of our group wrote that he bonded with two young boys who said to him that they’ve never known a Jew who wasn’t a settler or a soldier. They’ve made plans to hang out again. Another friend shared the conversation she had with one young man about the sea and who puts all the salt in it. He had only visited the sea once in his life, and still couldn't wrap his mind around it. My friend Elham, a Palestinian from Jerusalem who joined us this weekend, was overwhelmed by the work this weekend and seeing the lives of her fellow Palestinians who live under such different circumstances. Others felt enriched by the conversations they had over dinner, or by the quiet moments they had in the morning. In the face of systemic oppression, gridlock politics, ignorance-is-bliss mentality, and the perpetuation of occupation, hope seems like a futile pursuit. What is one day going to do? What is one conversation going to change? How can one shared plastic cup of sugary tea create a future? Yet, this weekend was something. Our dedication to end the occupation brought us here, and the small difference in one individual’s life is worth it. It was the beginning of a movement. And it will grow, it will grow.